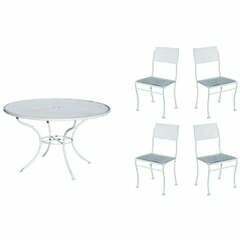 This beautiful vintage patio set includes a glass top table, four chairs, and three planters. The unique round glass top table features a tulip shaped spun fiberglass base. 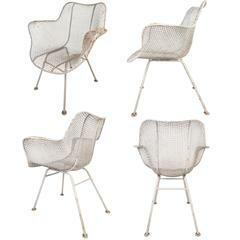 The stunning set of four sculpted patio chairs and three tulip shaped planters compliment any setting. A wonderful design that provides plenty of comfort without sacrificing style. Please confirm item location (NY or NJ). 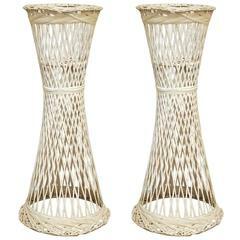 Measures: Chairs: 20 W, 20 D, 24 H Table: 41.5 diameter, 29 height Planters: 13 diameter, 23 height. age appropriate wear, some paint chipping, some dings, some discoloration, light scratches on glass top.